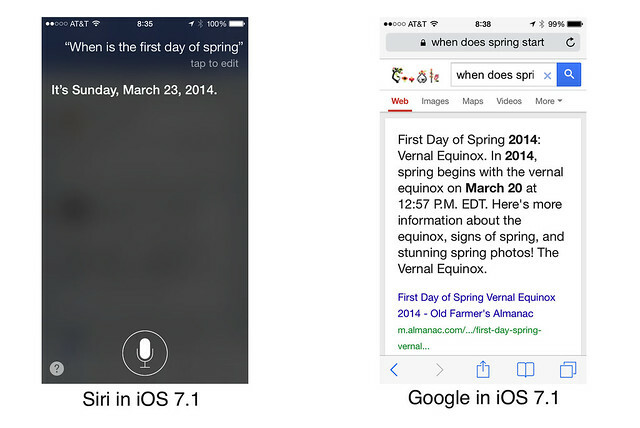 I couldn't be more frustrated about the fact that Siri in iOS 7.1 could not correctly answer the question, "When is the first day of Spring?" on the first day of Spring 2014. Siri said that the first day of Spring in 2014 is Sunday, March 23. When I asked Google via Safari, "When does Spring start?" The search engine got the answer correct. I know Apple can do better than this. From what source are they obtaining this answer? It makes no sense to me at all, and I am a huge Siri fan. I'm absolutely sure that by now, improvements from both sides would've had taken place and that they're as the superiorpaper writing services competing in a healthy manner although the new Google Assistant might throw Siri to the dust. I am tired of all this siri thing going on. It is just an application and it answers back just like 8 ball and people have made it something that is very annoying. Even at my essay help office, certain people are seem talking to their iphones saying siri this and that. If your answer will be wrong then you will out of this quiz competition. What Is The 4 Week Diet All About? Seriously awesome posting! You amazed by myself via this valuable offer strapped around with your personal very own. And perhaps what is definitely far more top-quality is undoubtedly an authenticity within the theme. Presently take a look check cashing lemon-grove Thanks a ton a great deal of a great deal. Very evaluated and well researched and written post. People should share this post with everyone. Great article.